We stayed dockside at the Marina for a few days extra, playing "catch-up." Went out to Beaufort's local restaurant "The Bricks" on Boundary Road, where we had a wonderful dinner - Ron ordered the cabbage soup and 'Da Schnit' - a HUGE portion of schnitzel that made for not only his dinner, but two servings of leftovers! (There are even mashed potatoes hiding under there!) I had a yummy BBQ pulled pork sandwich - just love the southern BBQ's! 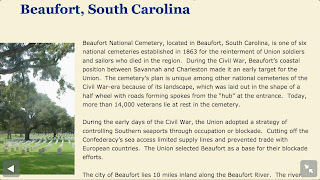 We learned more about the "Bricks" - across the street from the restaurant is a beautiful brick wall - and behind the brick wall - Beaufort's National Cemetery. Impressive, solemn, gives you pause, and yes, we know there were angels surrounding these grounds too! Heroes from the Civil War and subsequent are memorialized here.